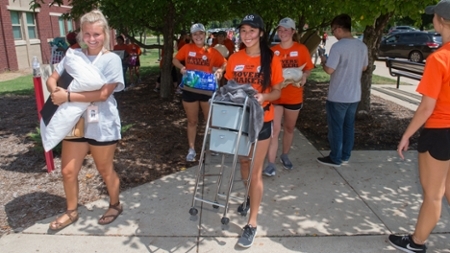 Southern Illinois University Edwardsville was full of new, smiling faces on Thursday, Aug. 16 as approximately 1,100 freshmen arrived on campus for Move-in Day. They are among the nearly 1,800 first-time freshmen comprising the Class of 2022. Approximately 500 student volunteers, called Movers and Shakers, along with 65 administrators, faculty and staff helped new students and their families unload their belongings and transport them into Woodland, Prairie and Bluff Halls, the students’ new home away from home. SIUE will be home for both of Cathy Christian’s children. Her daughter is a senior and her son just moved in to begin his academic journey. Bart Zabroac moved his daughter into her residence hall and is confident she made a great choice in SIUE. Throughout the weekend, a total of 2,700 students will move in and get settled into campus housing. Move-in Day marks the start of the SIUE Experience for incoming students. It aims to create a sense of community and connection to the University, introduce the SIUE values, put citizenship into action and set the stage for student success and retention. Students will attend an academic convocation ceremony on Friday, Aug. 17 in the Vadalabene Center. The ceremony will be followed by a grand Cougar Welcome parade where community members, SIUE alumni, faculty and staff will celebrate the Class of 2022 as they walk through campus. Additionally, students will take part in a community service day on Saturday, Aug. 18. A complete schedule of events for the SIUE Experience is available at siue.edu/admitted/experience/. Photo: Movers and Shakers helped incoming freshmen move into their residence halls on Thursday, Aug. 16.